← Gun Laws Forum at Trinity on Main Monday 4/22….Town Committee Discusses CT Fastraks, Economic Development…Yea To Minimum Wage Hike, Nay To Cross Endorsement Ban…. New Britain Democrats Oppose Ban On Cross-Party Endorsements….O’Brien For New Britain Events In May…..Push On For Wage Hike Law…….. In a resolution adopted at its April 25th meeting the New Britain Democratic Town Committee opposed legislation to ban cross-party endorsements — a move that would prohibit minor parties from endorsing major party candidates in local, state and congressional elections. The proposed ban (Raised Bill 1146), supported by State Senate President Donald Williams, would end the cross endorsements used in recent elections by the labor-backed Working Families Party (WFP), the “Independent” Party, a Libertarian-leaning group or other minor parties that qualify for ballot lines. In 2010, for example, Governor Malloy narrowly defeated his Republican opponent with votes from labor progressive voters who chose Malloy on the WFP line. The New Britain DTC resolution takes issue with the claims made by State Senator Williams who contended in testimony that cross endorsements may cause “over-voting” problems and “confusion” at the polls.. However, “over-voting” — meaning a ballot marked twice for the same candidate — has not been a problem in recent elections in using optical scan voting systems in New Britain. Optical scan voting detects the “over votes” and allows election officials to accurately record one vote for a candidate. A bill to raise the CT minimum wage rate, strongly supported by the city’s legislative delegation and re-endorsed on Thursday by the Democratic Town Committee, picked up support from Governor Malloy and House Speaker Brendan Sharkey (D-Hamden) (CT Mirror story) on Friday. The fair minimum wage law contained in SB 387 raises the state minimum hourly wage from $8.25 to $9.00 on January 1, 2014, and from $9.00 to $9.75 on January 1, 2015. As of July 1, 2015, it would require annual minimum wage adjustments based on increases in the Consumer Price Index (CPI). Governor Malloy, in his endorsement, called for an increase without the cost-of-living adjustments contained in the legislation. O’Brien for New Britain, Mayor Tim O’Brien’s re-election committee, has announced plans for two May fund-raisers, including a reception with special guest, Governor Dannel Malloy. On Monday, May 13th from 5 to 7 pm, Governor Malloy will appear with Mayor O’Brien at a reception at The Red Rock Tavern, 369 Capitol Avenue in Hartford. On Thursday, May 23rd from 6 to 8 pm, Cong Elizabeth Esty (D-5) will be the special guest at Great Taste Restaurant, 597 West Main Street, New Britain. The Great Taste fundraiser will be hosted by former City Treasurer Jason Jakubowski, Alderman David DeFronzo, former State Senator Joe Harper and Attorney and former Ward One Alderman Jamie Sullivan. To RSVP and for donation information, please call Mike Farina at 860-748-5142 or e-mail mike@thevincigroup.com. These are O’Brien for New Britain events, Adrienne Benjamin, Treasurer. 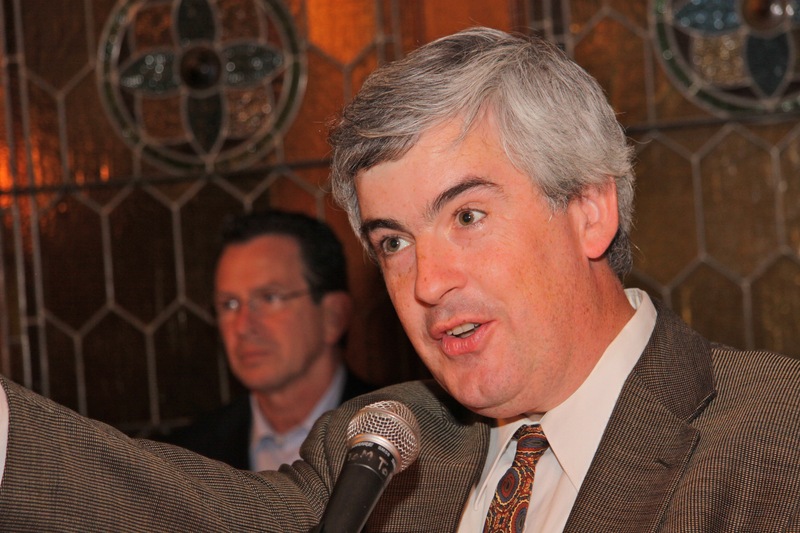 The Connecticut Sports Writers Alliance will recognize DTC member Alton Brooks with an award at its annual 72 Gold Key Dinner on April 28th at the Aqua Turf in Southington. 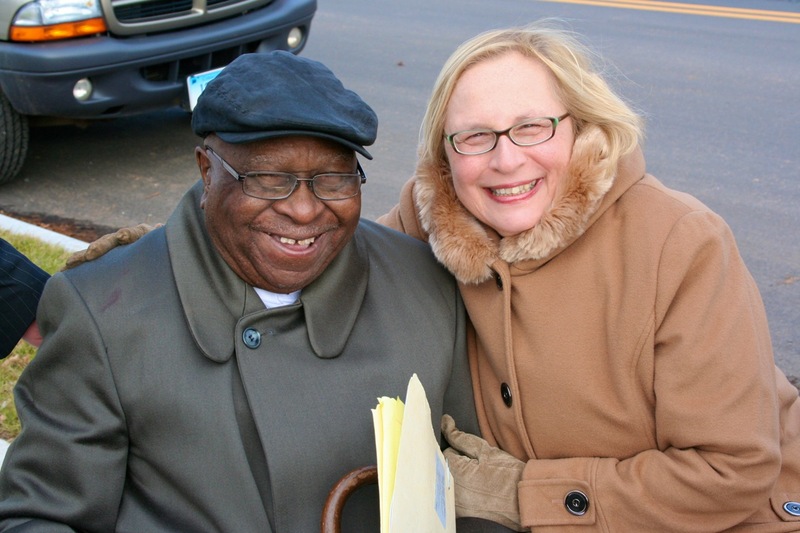 Alton Brooks with State Senator Terry Gerratana at the dedication of Alton Brooks Way in New Britain. Brooks, who last year was recognized by the state African-American Affairs Commission for his lifetime achievement in civil rights and community service and by the city with the dedication of Alton Brooks Way, will receive the John Wentworth Good Sport Award at the Aqua Turf dinner that will begin at 4 pm. Brooks, a founding director of the city’s Human Services Agency, is a longtime basketball coach and mentor to city youths. Tickets to the Sport Writers dinner are $75. Contact Sports Writer Ken Lipshez at 860-673-6048 for a reservation. This entry was posted in Endorsements, Fundraiser, General Assembly, Meeting/Event, Minimum and Living Wages, Tim O'Brien, Weekend Update. Bookmark the permalink.